In this blog we will talk about the steps in placing dental implants. • At initial consultation, following full discussion of all possible alternatives, the dentist will assess the feasibility of providing implant treatment. X-rays will be taken and models of the teeth prepared. A written treatment plan will then be formulated detailing the sequence of treatment and associated costs. • Implant placement is a relatively simple minor surgical procedure that can be performed under sterile conditions in a dental surgery. The treatment is performed under local anaesthesia with sedation if required. If, during assessment, the underlying bone is deemed deficient, a number of options are available for bone regeneration. Bone regeneration is carried out prior to or at the same time as implant placement depending on requirements. • Implants can take from six weeks to six months to fuse with the patient’s bone. During this integration period, temporary dentures or bridgework can be worn as appropriate. In some cases, temporary teeth can be fixed to the implants while they integrate in a process known as ‘immediate loading’. • Once integrated, the implants can be brought into function with a variety of new teeth options (definitive restorations) ranging from a single crown, small or large bridge or a removable overdenture. A dental technician who works closely with the dental surgeon constructs these definitive restorations. • Following completion of implant treatment, the patient must regularly and thoroughly clean the new teeth (restorations) as instructed by their dentist. A dental hygienist may also advise on care and maintenance of the restorations and natural teeth. Regular visits to your dentist are essential so that the health of the soft tissue, bone levels and the integrity of the restoration can be reviewed. Can you wear replacement teeth whilst going through implant treatment? If the teeth being replaced by dental implants are in a clearly visible part of your mouth you will most likely want to have some teeth present whilst the treatment is underway. There are a number of ways that this can be done, ranging from simple plastic dentures to removable bridges. If replacement teeth are used during treatment stages it is important that they do not apply uncontrolled pressure to the underlying implants. You should expect to make a number of visits after the implants are placed and before they are brought into function, for small adjustments to any temporary teeth. They may not look as aesthetically pleasing as your final restoration. Dental implants are routinely placed beside natural teeth and this is generally very safe to do. The only exception to this would be if the natural root was very curved or tilted unfavourably in the proposed path of the implant. This could cause the root to be damaged by the implant; however, this can usually be avoided by careful pre-operative planning. When multiple implants are placed, they are routinely joined together in the same way that a bridge supported by natural teeth would be designed. 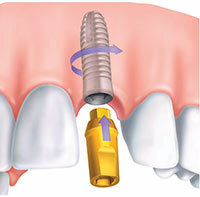 When implant-supported teeth are linked together, they are mechanically stronger than the individual parts. If enough implants are available, it is often easier and just as effective to make several smaller sections of bridgework each supporting a few teeth. The overall effect in the mouth is the same and if you ever need to repair one of the small sections, this can be much easier to do. Again the bone quality and the number and position of the implants will largely determine which option is most suitable for you. Most patients will be familiar with the dental anaesthetics used for routine dentistry and will know how effective they are. Implants are placed using the same anaesthesia. Depending upon the complexity of your case, the operation might take anything from 30 minutes for a single implant, to several hours for complex bone grafting and multiple implant placements. For most patients, any of the over-thecounter/basic painkillers that you might take for a headache will be adequate for a few days. If you experience more discomfort than this, contact your treatment provider who can prescribe a stronger medication. Healing is generally straightforward and any stitches are removed a week to ten days later. During the first few days you should report any unexpected levels of pain or swelling so that they can be assessed. If in doubt always ask for advice, as early detection of a problem will often lead to a simpler solution. You may also be asked to take a course of antibiotics and to follow some simple procedures such as rinsing with salt water or an antiseptic mouth rinse. It is important that you carry out these instructions. If the implant surgery is going to take a long time can you have sedation or a general anaesthetic? Although it is quite straightforward to provide good pain control during surgery, most people will be quite anxious. There is no need to suffer in silence, as there are several very effective means by which you can achieve a relaxed state. • Relative analgesia – Some operators may recommend a procedure called ‘relative analgesia’ where you inhale a mixture of nitrous oxide (laughing gas) and oxygen through a small mask placed over your nose. This gas mixture is breathed for the duration of the treatment stage. • Oral sedation – Another simple way to aid relaxation is to be given a dose of a shortacting medication such as Temazepam (normally used to help with sleep difficulties). This will reduce anxiety for most patients and provides a very good effect for uncomplicated surgical stages taking less than an hour. • Conscious sedation – For treatment of greater complexity it may be suggested that you have a more controlled way of keeping relaxed and comfortable during the surgical stages. This is known as a ‘conscious sedation’ and is distinctly different from a general anaesthetic, because you remain alert enough to respond to simple instructions that may be helpful to the surgeon – however, you will remember almost nothing about the treatment stage. It is particularly beneficial for procedures taking more than an hour where a hospital admission is not required – this is probably true for the majority of treatments related to dental implants. For a routine ‘conscious sedation’ a carefully controlled amount of sedative is delivered through a vein in your arm or hand for as long as the treatment takes. It is a very safe procedure during which your heart rate and oxygen levels are monitored throughout by an anaesthetist. With conscious sedation, a normal dental local anaesthetic is injected around the proposed implant sites. Most people do not remember this stage because the sedation has already taken effect by the time the dental anaesthetic is given. • For procedures involving oral or conscious sedation you may be asked not to eat or drink for at least four hours prior to the surgery and you will need to arrange for an adult to take you home. You will also be advised not to operate any machinery for at least 24 to 36 hours afterwards. • General anaesthesia – General anaesthetics require a hospital admission and are mainly, but not exclusively, used for complex cases such as where bone is being grafted from the hip to the mouth, or where large numbers of implants are being placed at the same time. Most patients will not require a general anaesthetic since conscious sedation is much safer and has fewer post-operative complications. In general the survival rate for dental implants is around 95%; however, in practice this could mean that 1 in 20 of the implants placed might not survive in the long-term. Implants which survive can suffer other problems including periimplantitis, gum recession and fracture of the restoration. It is a good idea to discuss how your treatment plan might be affected by the loss of an implant. There are many reasons why a dental implant can fail including smoking, oral hygiene, and systemic disease. In these particular risk groups, the failure rate could be expected to be much higher. If an implant does not integrate well with the surrounding bone it will eventually become loose and no longer be able to support replacement teeth. Commonly the failing implant causes no discomfort and if there are enough implants remaining, it may not be necessary to replace it at all. It is important that you discuss the possible complications that may occur with your dentist.